So you've had enough of simply "watching TV," and you're eager to move on to the home theater projector experience. But what are the best projectors? And which one is right for you? 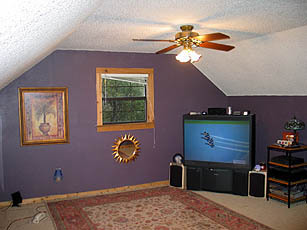 Before shot of Projector People customer's living room with standard rear-projection TV. After shot of living room with a home theater projector. Let's be upfront here. Projectors are the smart choice for the savvy consumer. Today's home theater projectors come in two basic technologies: LCD (containing three tiny liquid crystal display devices with a series of mirrors and lenses) and DLP (which replaces the three LCDs with a silicon chip). Projectors are so compact and lightweight they can be hidden on a bookshelf, mounted discreetly on the ceiling or even hidden behind a screen. Speaking of screens, today's home theater screens are thinner and lighter than any flat screen on the market. And when it comes to cost, home theater projectors and screens are less expensive (by cost-per-viewing-inch) than dinky old TVs. There are so many home theater projectors. Which do I buy? Good question. We designed this crash course in home theater projectors to help. Once you've mastered the basics (and that won't take long at all! ), you'll be able to pick the best projector for you.